In our long experience renovating homes, we’ve found there is often a bathroom off the hallway that shares a wall with the kitchen. This makes sense since plumbing was made more convenient for the builder by grouping them together. 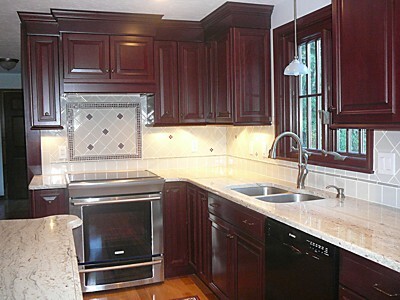 But usually, the homeowner has only planned to renovate the kitchen. Why do more? While increasing the scope of the renovation to include the bathroom will increase the cost of the project, it really makes the most economic and logistical sense in the long run. First of all, the bathroom in an older home, although impeccably kept, could be vintage 1960’s but would look like 1940’s next to a brand new kitchen. Second, construction work is messy and disruptive, a necessary inconvenience to making home improvements. Why go through it more than once? Having a newly remodeled kitchen is exciting and once the construction is completed the homeowner may find that the adjacent bathroom then looks outdated to them. But who wants to start another project when life is just returning to normal? Remodeling both the kitchen and bathroom at the same time therefore makes logistical sense. Better yet, it makes economic sense too. The footprint of the bathroom is usually small compared to the kitchen, so demolition costs will only increase slightly. The construction crew and contractors for electricity and plumbing are already going to be there, and the dumpster. The time needed to add bathroom lighting fixtures or making minor adjustments to the plumbing is short. Permits and inspections can be done on both rooms at the same time. 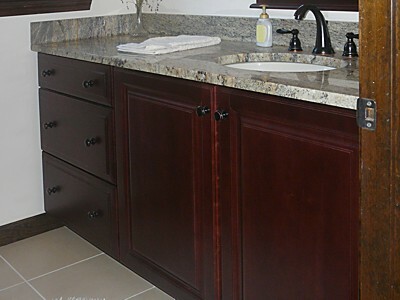 The cost for building materials will also be minimal since a bathroom vanity is only a small additional cost. There would only need to be one, maybe two, or three cabinets added onto the kitchen cabinet order. This is usually a small additional cost in the grand scheme of things. The countertop people are coming in for the kitchen, so why not just include the bathroom vanity at the same time? To keep costs low, you might be able to keep the existing bathroom fixtures. The new vanity plus fresh paint and decorative hardware alone will improve the bathroom. If your budget allows, you could consider replacing the toilet with a new water-saving model. If you are replacing flooring, the additional bathroom area will be a fraction of the cost. Again, the workers are already there, so you are just adding a few square feet of floor covering for a small bathroom. That minimizes the installation costs for everything, as you are not paying large minimum charges for someone to come out to do a very small job at a later date. So, our advice is to do it all at once. Get the headache over with all at once. Say goodbye to the contractor — and you’ll be thanking your designer, as you enjoy your new kitchen and bath!